When you think of Queen – who are, let’s be honest, one of the greatest live bands ever, and not too shabby when it comes to recorded hits either – you don’t really think of highbrow entertainment. So yes, this is an extremely basic biopic that follows the kind of “greatest hits / every second line is blatant exposition” that usually signals cinematic death – but that’s in no way a bad thing. Over its two hours and fifteen minutes (which only cover around 12 years in Freddie Mercury’s life) this barely gives Mercury two dimensions, and that’s definitely two more than anyone else gets: the rest of the band are sympathetic (and definitely get credited for the songs they wrote) but they’re daggy dads with hilarious hair from start to finish. 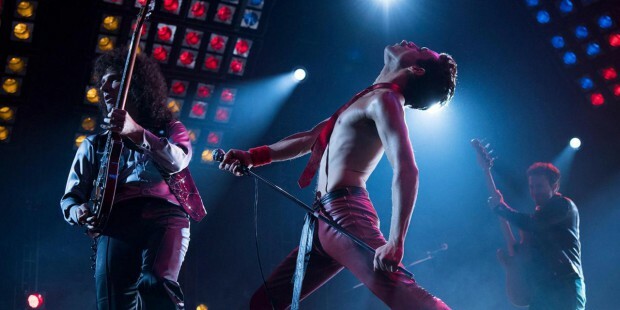 But it gets two things spot-on, and they’re the two things everyone interested in this film is coming to see: there’s a whole lot of Queen songs (the climax is set at Live Aid and they re-enacts the full 20 minute set) and Rami Malekas Mercury is far, far better than this film deserves. He’s achingly human in scene after scene that without him would just be a clump of clichés: he makes this jukebox musical of a film sing. David (Steve Carell) has a problem. You wouldn’t know it from the fact he’s living in a million dollar house on the fringe of San Fransisco while making a living as a freelance writer (it’s the early 00s; that doesn’t make this any more plausible), but it seems financial security, a second wife who spends her days painting trees and a couple of adorable kids just can’t keep his mind off the fact that his oldest son (Timothée Chalamet, the best thing in this film) from his first marriage is on meth. Drugs are bad, but that doesn’t mean movies about drugs also have to be bad. This is based on a pair of memoirs – one by David Sheff, the other by his son Nic (played here by Chalamet) – and it often feels like any time their stories diverged the film used the least offensive version. David occasionally gets shouty and clearly neglects the rest of his family but is also just as clearly A Good Guy; Nic lies and relapses and asks his dad for money but the lowest he sinks is to steal $8 from a piggy bank. If this was happening to your family, it’d be a nightmare: seeing it on screen, it’s a yawn. Michael Moore has dropped off the radar in recent years – despite being one of the few left-wing pundits to accurate predict a President Trump – so this documentary has been pitched as his return to the big stage covering the big issues. Which he does: unfortunately he can’t quite figure out how to make an actual movie out of them. Instead, this is a jumbled collection of various talking points that’s really good at reminding you of what left-wing social media in the USA was outraged about six months ago. That’s not to say it’s solely of use as a historical document, as there actually is a decent film (or television feature) buried under Moore’s mea culpa’s for hanging out with right-wing types for laughs years ago and trips around the US checking in with various fire-up political candidates and school shooting survivors. Unsurprisingly, this better film kicks in when Moore returns to his home town of Flint, where thanks to political corruption and greed, the drinking water has been toxic for years now with no end in sight. Moore’s anger (mostly at the crooked Republican governor, but also Obama) is genuine, the tragedy both awful and avoidable. These scenes shine; the rest of the film is a muddle. The hook with this particular version of Halloween – one of close to a dozen sequels to John Carpenter’s still chilling original – is that it’s cleared away all the crud. All the other films never happened: this (directed by indie film fave David Gordon Green) is the true sequel. But this is the second time the Halloween series has pulled that trick (anyone remember Halloween: H20? ), and this case what that really means is that they’re just doing the first film all over again. Once again Michael Myers / The Shape breaks out of a mental hospital; once again he goes on a murder spree; once again he ends up focusing on a member of the Strode family. The big twist here is that Laurie Strode (Jamie Lee Curtis), sole survivor of the first film, has grown up to be a Sarah Conner-style survivalist (ironically, as Myers is basically a supernatural Terminator) who ruined the life of her daughter (Judy Greer) with her paranoia. Her granddaughter Allyson (Andi Matichak) is (relatively) angst-free – but when Myers busts out of a prison bus and comes a-killing, she’s the one that he ends up stalking. It’s a solid Halloween movie, with a few good scares and decent gore, but it’s hitting the same old notes yet again. Great score though (from Carpenter himself!). After a disastrous publicity tour sank his first book, high school English teacher Nicholas Cutler (Alan Dukes) is hoping a zombie novel is his ticket back to the literary life. But can he go a week without flinging bile at his fellow teachers, insulting his students, and dismissing his family? Of course not: much of the drama in Australian writer / director Heath Davis’ witty and well-shot (it’s set in the Blue Mountains) film comes from seeing just how awful Cutler can get before things fall apart. Cutler is surrounded by women (including Airlie Dodds, Susan Prior and Rose Reily) who’re more interesting than him; fortunately, a tortured yet charming performance from Dukes makes his acerbic nature – and this film – reliably entertaining, even if it’s built around a man you’d happily run a mile to avoid.